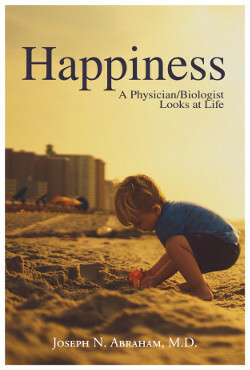 Subscribers to Bookscrounger.com receive a free e-version of Happiness. See the insert in any page to subscribe. With this question, Dr. Abraham explores the confusion and unhappiness that dominate so much of our lives today. In the modern world, we have all of the luxuries that humanity has ever dreamed of: security, food, health, comfort, convenience, and limitless entertainment. Then why are we so unhappy? As a physician, a research biologist, an educational activist, a social entrepreneur, and an inveterate traveler, Abraham has seen unhappiness from rural emergency rooms to inner city ICUs, from Manhattan skyscrapers to the slums of the Orient. And he tells us that the people in these different locales are more similar in their confusion and more closely linked in their suffering than they might imagine. He takes us on a journey inside ourselves, and inside of our ancient ancestors; how we are not so far removed from the stone age as we imagine, and why many of the dreams and fears we inherited from the caveman do not serve us any more. Yes, money can buy Happiness — for just $24.95!